This home in Oakerthorpe, Derbyshire was originally a two bedroomed bungalow which the owners had converted into a three-storey house with an extension to make the property wider. We supplied and fitted windows and doors throughout to help the owner create the “wow” factor they desired. We used an Inox Composite Door and anthracite Grey UPVC windows manufactured & installed by us in Liniar Profile. 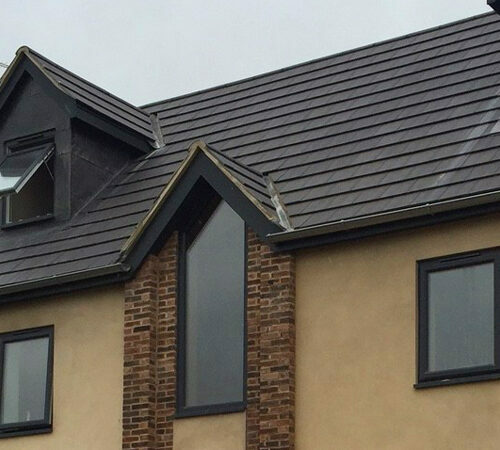 We are particularly pleased with the shaped landing feature window which echoes the shape of the roof windows to create a very distinctive look for the property. It’s always a pleasure to use our skills in manufacturing bespoke elements such as this as we can make windows to most shapes and sizes in our Nottinghamshire factory.